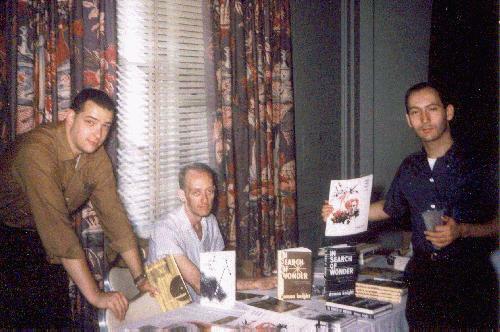 The Advent Publishers display table at the 1960 Worldcon. Robert E. Briney, Earl Kemp and Joe Sarno. Photo by James O’Meara. ReAnimus Press has acquired Advent:Publishers. Advent will become a ReAnimus subsidiary, and when its titles are reissued they will appear under the Advent name. Advent was founded in 1955 by Earl Kemp, Robert Briney, Sidney Coleman, James O’Meara, George Price, Jon Stopa and Ed Wood. The following year Advent published its first book, In Search of Wonder, a collection of critical essays by Damon Knight. The last book from Advent came out in 2006, Heinlein’s Children: The Juveniles by Joseph T. Major. ReAnimus Press is an ebook publisher founded by Andrew Burt, who is also known for his dozens of short stories, and past service as a vice president of SFWA. ReAnimus produced its first book in 2011 and now has around 125 titles available for sale by Norman Spinrad, Ursula K. Le Guin, Ben Bova and many others.